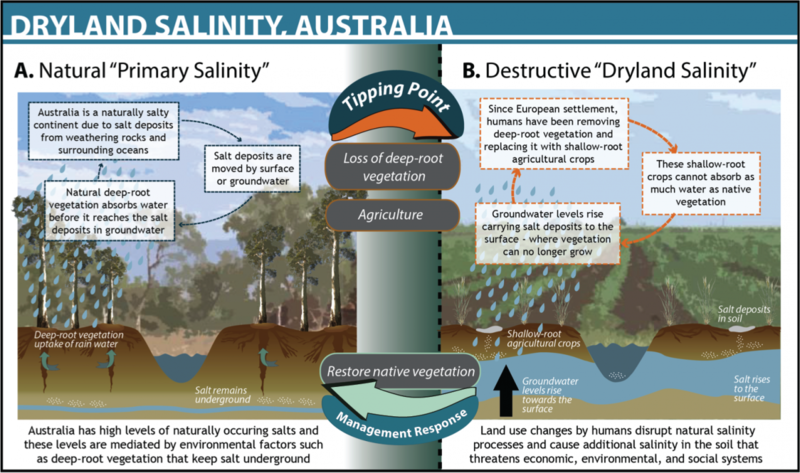 Salinity in the soils, groundwater, and rivers is a serious threat to ecosystems and human communities in Australia. The consequences of clearing native vegetation over the past few centuries now threatens major regions of Australia’s continent and the productivity and sustainability of its agricultural economy. While a national policy to control, monitor, and potentially reverse the effects of Australia’s dryland salinity exists, management is often in the hands of private land owners, whose perceptions of the severity of dryland salinity often underestimate its real impact.5 Enforcement of land use policies by these diffuse land managers is challenging due to the geographic size of the affected land and the significant time lag between the cause of salinity and the enduring effects.2 The management plan clearly identifies the need to adapt land use practices to local conditions and, more importantly, empower local farmers and communities to be their own stewards. How farmers might be motivated to creatively tackle this enormous management challenge, and avoid more tipping points in dryland salinity across the continent remains to be seen. 2Australia National Heritage Trust. 2000. “Dryland salinity in Australia: A summary of the national land and water resources audit’s Australian dryland salinity assessment 2000. 3Clarke, C.J., George, R.J., Bell, R.W., and T.J. Hatton. 2002. “Dryland salinity in south-western Australia: its origins, remedies, and future research directions.” Soil Research 40(1): 93-113. 4Mayer, X.M., Ruprecht, J.K., and M.A. Bari. 2005, Stream salinity status and trends in south-west Western Australia, Department of Environment, Salinity and Land Use Impacts Series, Report No. SLUI 38. 5Kingswell, R. 2003. “Dryland salinity: spatial impacts and farmers’ options.” 14th International Farm Management Congress. Perth, Western Australia.